An eager DIYer and crafter, Donna enjoys sharing fun and creative tutorials with others so they can learn from her successes and mistakes. 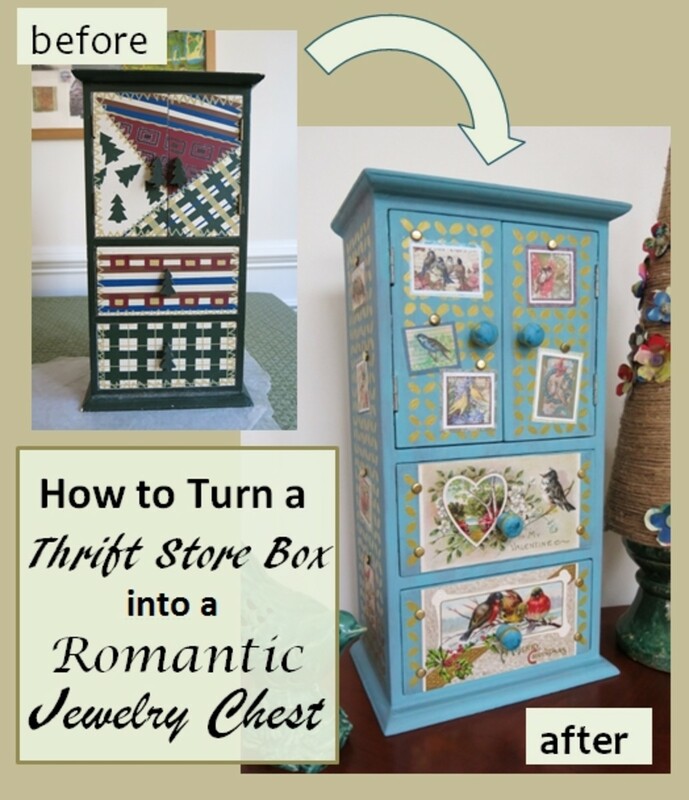 I'd been looking in thrift stores for an old jewelry cabinet or armoire to upcycle into a new jewelry box. On the day I searched for one, however, I could only find this weird Christmas-themed box. Although I was a little disappointed, I decided to turn this old piece into a lovely jewelry chest. 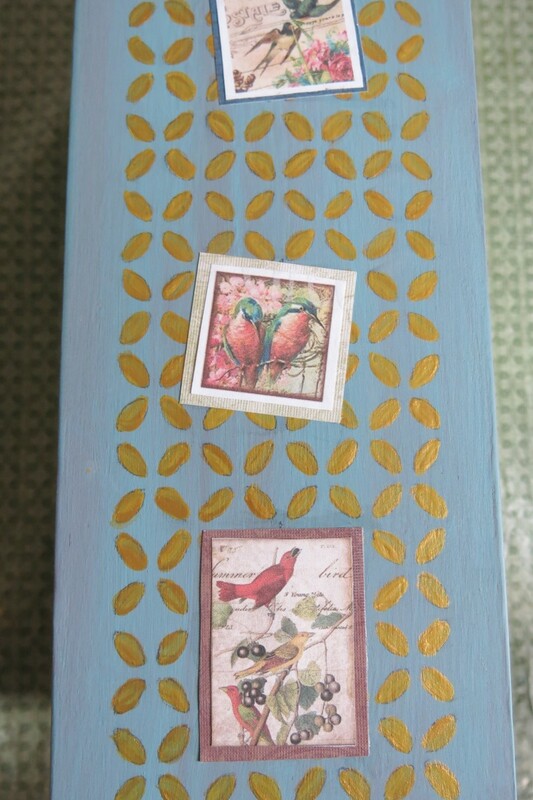 Using some paint, stencils, scrapbook paper, and vintage postcards, I gave this old box a new look and purpose. 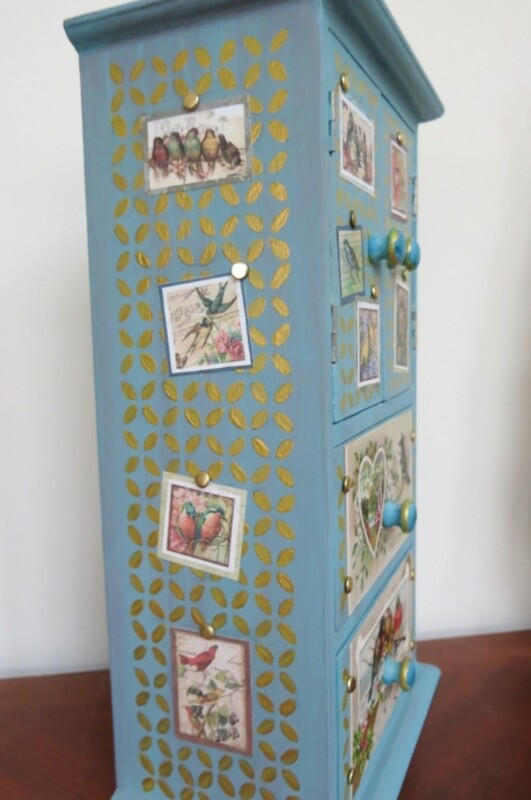 When I shopped for a box, I wanted a jewelry armoire like the one pictured below. These cases were popular in the 1970's and 80's, and you can usually find them now in thrift stores and at garage sales. Instead, I found this weird wooden box. However, it was intact, and the price was right at $2.99. Good Condition: The box shouldn't be missing any parts. 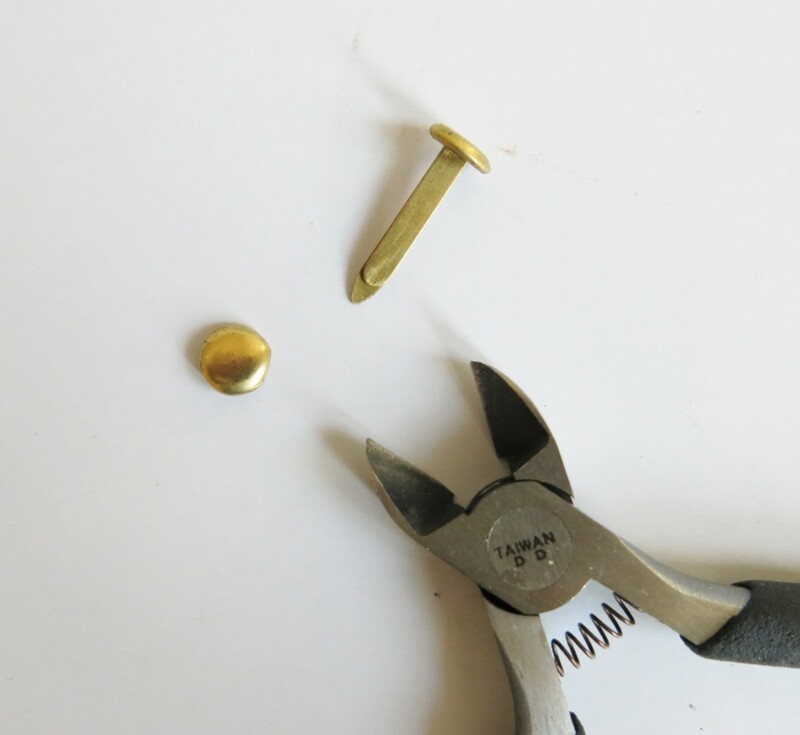 Avoid pieces with deep scratches or broken parts unless you have the skills to repair it. 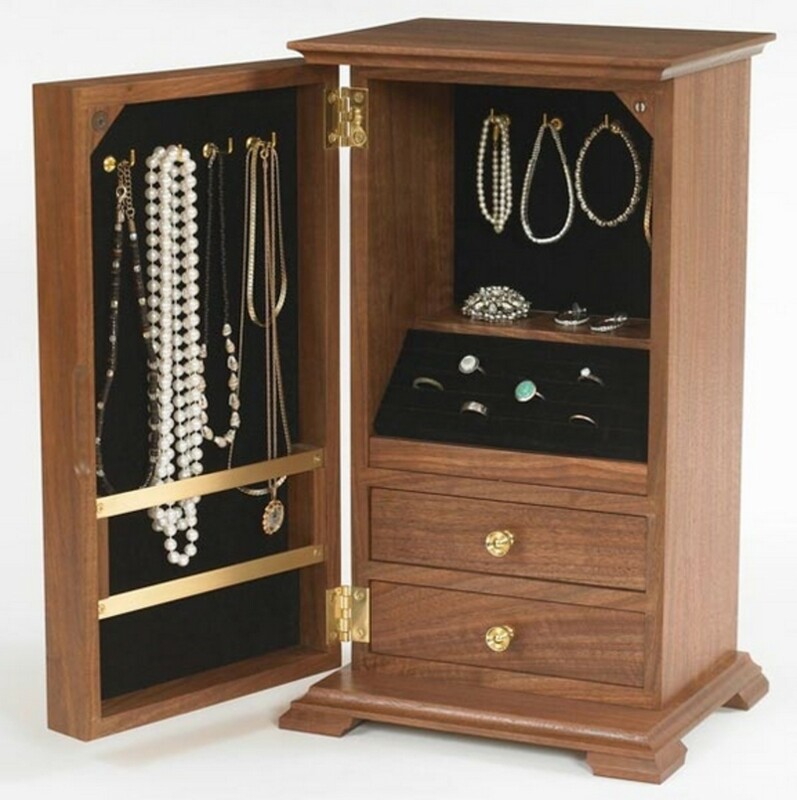 Fits Needs: These jewelry armoires usually have drawers for small items and a hanging area for necklaces. Make sure the design meets your needs for how you want to use your finished case. Good Hardware: Check to see that the hardware is removable and replaceable if you don't like it. My box had little Christmas trees for drawer pulls. I wasn't sure I was going to be able to get them off, but I decided to take a chance with it. Box: Boxes come in many styles, with features that could include glass doors, hinged tops, and multiple drawers. If you have a choice, choose a box with a lot of surfaces you can decorate to fit your taste. Primer Paint: Again, the need for primer or the type of primer you use depends on your box, but you will want to create a fresh surface to decorate. Paint: You'll need paint in the color(s) of your choice along with paintbrushes, sandpaper, and other painting supplies. 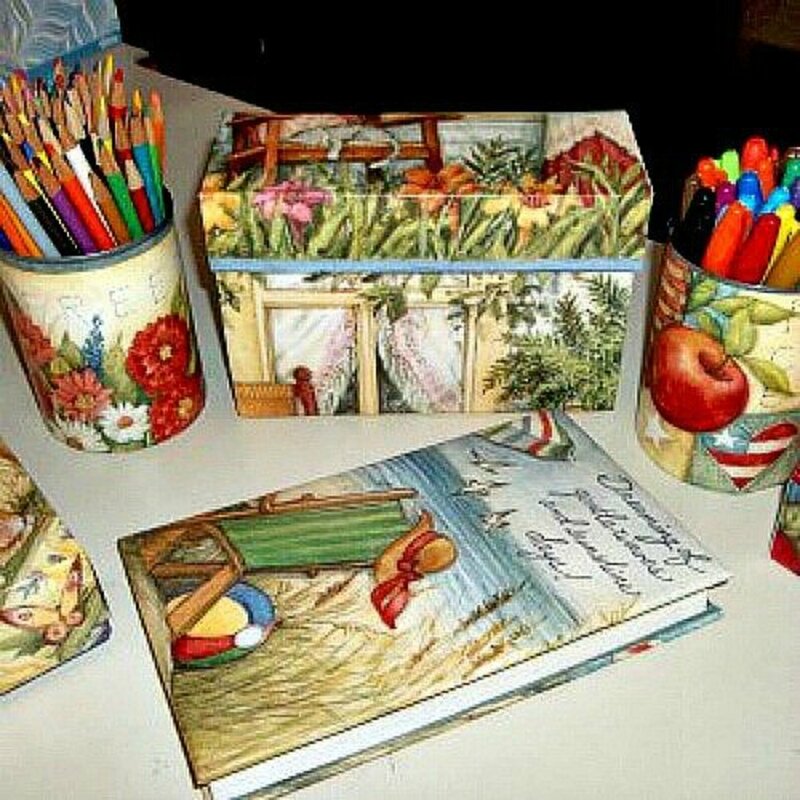 Decorating Materials: These include stencils, scrapbook paper, photos, postcards, and other materials of your choice. New Hardware (optional): Hardware includes things like drawer pulls or knobs. This only applies if you decide to change or add hardware to your box. Glue: You will need different types, depending on your box and design. 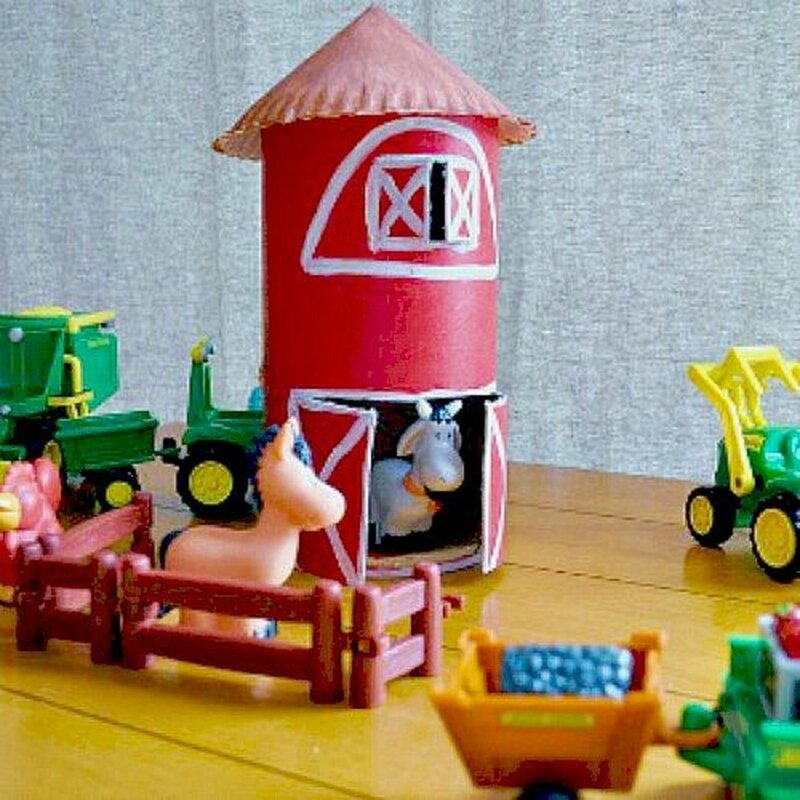 I used Mod Podge and a glue stick. Basic Supplies: These include pencils, a ruler, scissors, a screwdriver, and a hammer. 1. Remove any hardware before priming and painting the box. I was able to use a chisel and hammer to remove the tree drawer pulls from my box. Hopefully, your hardware is easier to remove. 2. Use a coarse sandpaper to even out the box surface, especially where your hardware was. Follow this with a light sanding using a finer sandpaper. Wipe down your box to remove any dust or dirt. 3. When your box surface is smooth, use a primer to prepare the box for new paint. Be sure to tape off any hardware that you can't remove with painters tape. I used some latex primer (water-soluble) that was left over from another project. I had to apply a few coats to cover the old paint. 4. Paint your box with the paint and color(s) of your choice. I used a chalk paint I found at the craft store. It took a few coats of paint to cover the surface completely. If your jewelry cabinet has glass doors, consider covering them with paint (or tissue paper) to give them a fresh look. 5. 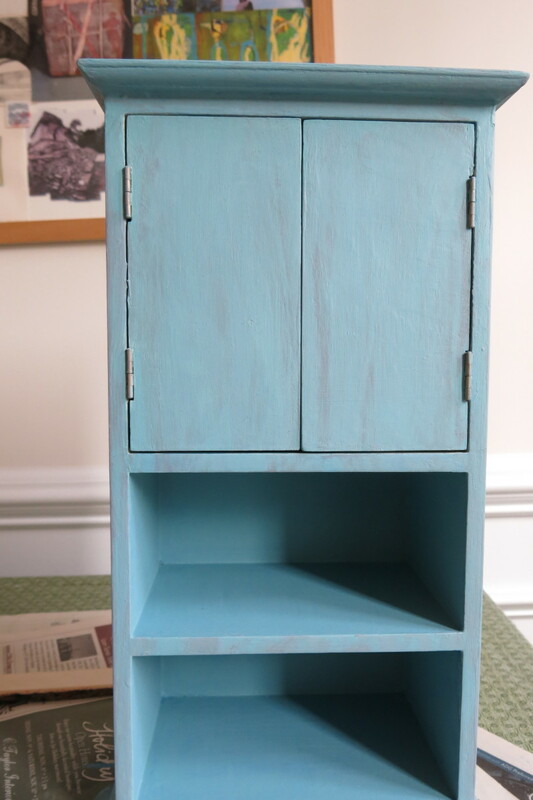 This step is optional: To give my box a slightly aged look, I applied a light wash of gray paint to the surface. I used a very wet wash of gray acrylic paint to each side, let the paint sit for a few seconds, and wiped some of the wash off with a paper towel. 6. I wanted to give my box a romantic vintage look, so I used a small repeating stencil and some gold acrylic paint to add a design to the sides, top, and front of my box. Stencils are an easy way to add decoration and color to your box, particularly if it has doors or glass panels. Stencils are available at most craft and home improvement stores. 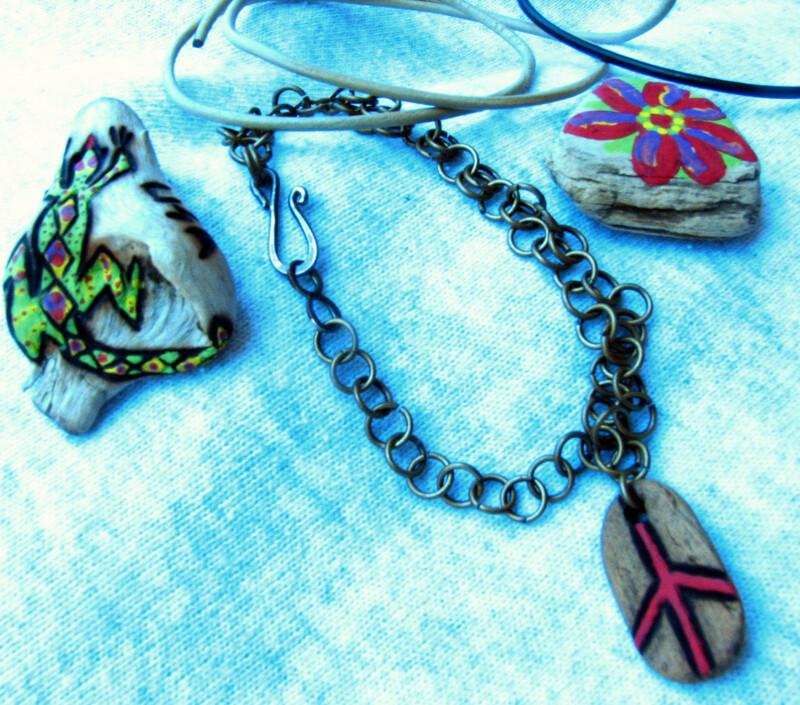 They come in a wide variety of designs and styles and are easy to use. 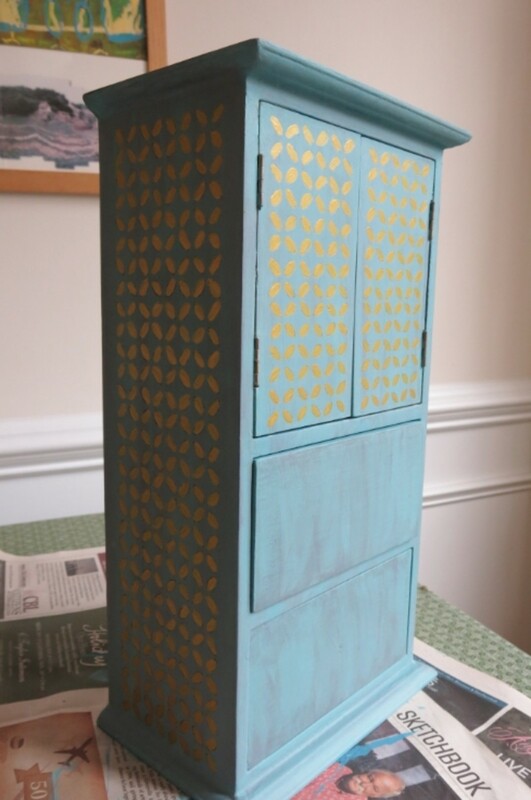 For this jewelry case project, I would suggest using a smaller stencil that fits the size of your box. 7. 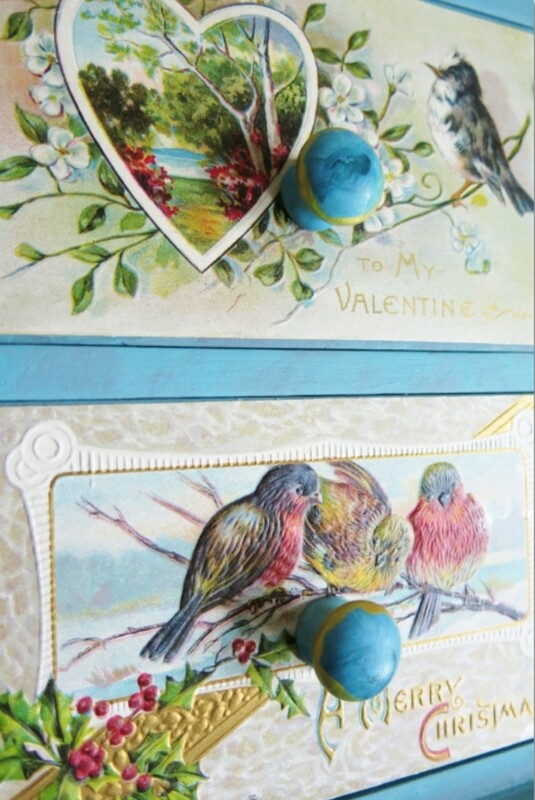 To add to the vintage look, I glued two old postcards to the front of my drawers. I used Mod Podge to glue the postcards in place added extra stenciling down the sides. You could also use photographs or scrapbook paper to decorate your drawer fronts. I was going to glue another postcard on the top of my box. 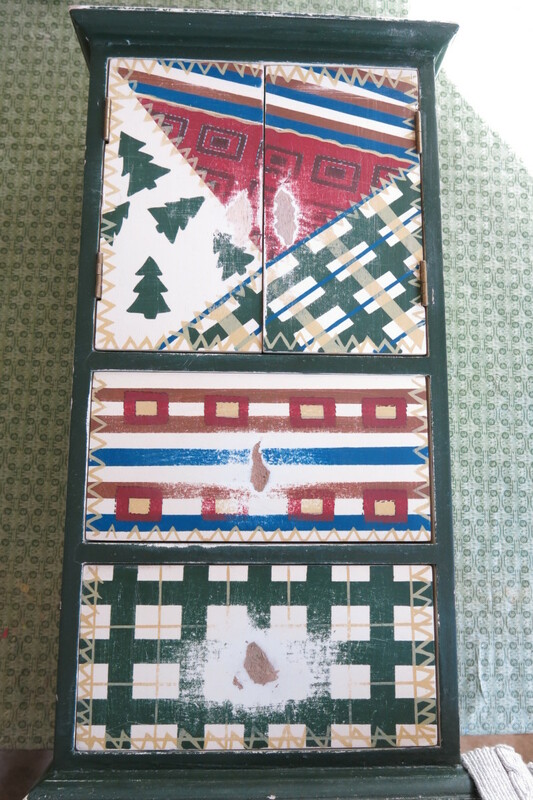 However, I tend to pile odds and ends on the top of my boxes, so I just stenciled the surface. 8. I did not put any Mod Podge or sealant over my postcards or paper images. This would probably change the colors in the images, which is something I didn't want. If your box is going to be handled often, you may want to avoid putting paper on the drawers. 9. I found some smaller images of birds online and in magazines to make mini-postcards. 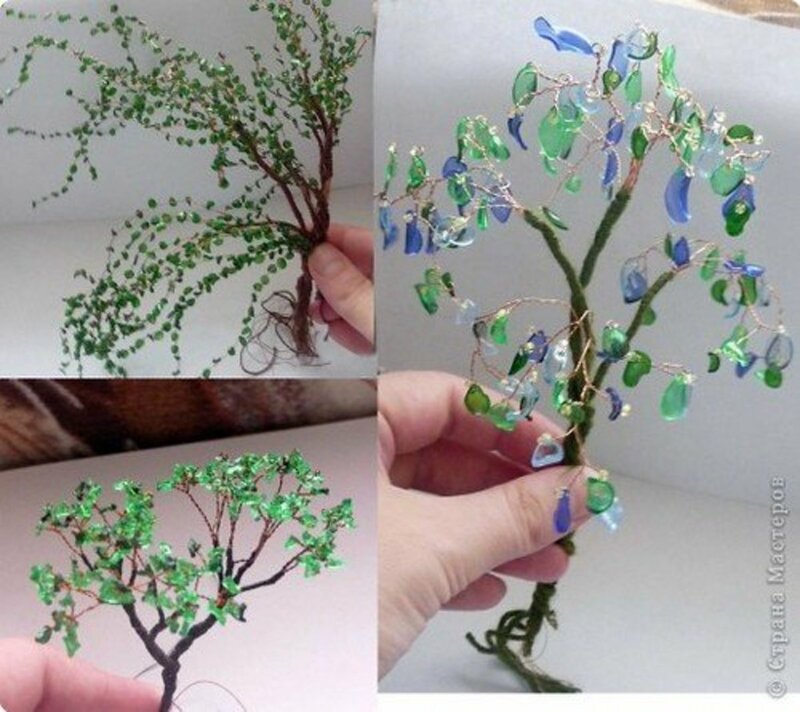 My plan was to hang these small images on the doors and sides of my jewelry case to make it look like they were pinned in place. 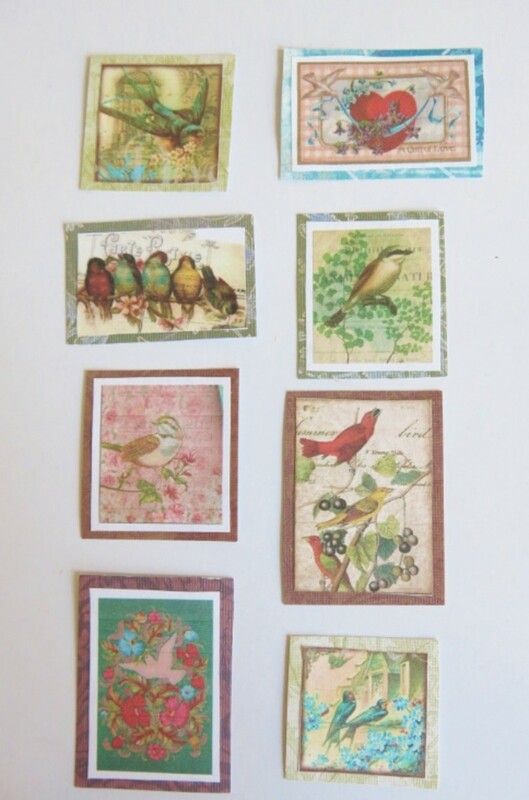 I glued each bird image to a coordinating piece of scrapbook paper to make a pretty border. You can use any images for these smaller postcards that you want. There are a lot of vintage-looking stickers or scrapbook paper at craft stores you can buy. 10. (Optional) I used brads to make the pinheads for my mini-postcards. I used wire cutters to carefully cut off the legs so I could use just the round part. 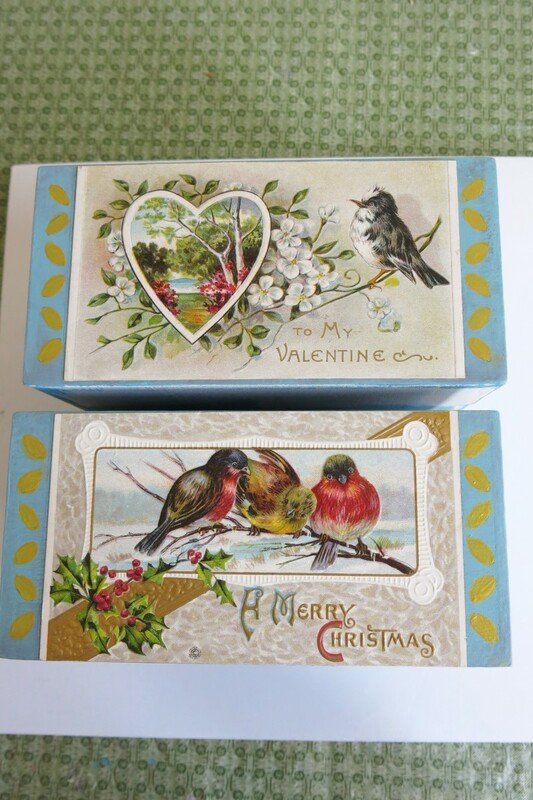 You can find plastic gems or rhinestones at the craft store to glue on your box as decoration. 11. To replace the box pulls, I bought unfinished wooden mushroom knobs. You can find different options in stores or online. I painted my knobs with coordinating paint and gold trim. Then I carefully chose their placement to ensure they didn't interfere with the images on my postcards. I drilled the holes for my knobs from the inside of my drawers and screwed them in place. 12. I used more Mod Podge to attach my postcards to the doors and sides of my box. I placed my images so they looked like they were pinned to a bulletin board. 13. I glued my metal brads with super glue. 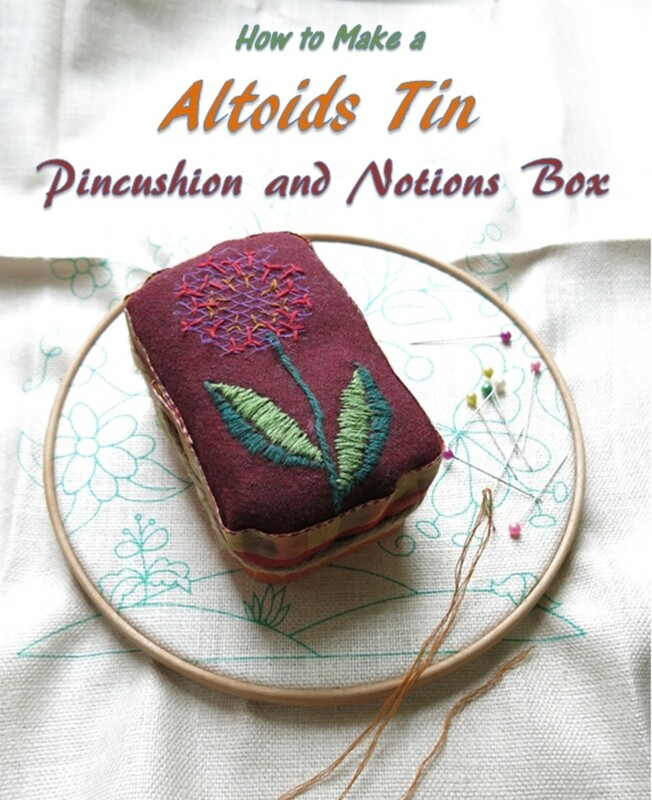 I also attached some pin heads around my vintage postcards on the fronts of my drawers. 14. Don't forget to finish the inside of your box too! I glued some scrapbook paper on the inside of my drawers and to the backside of the doors. This gave all sides of the box a fresh look and completed my romantic jewelry box transformation. 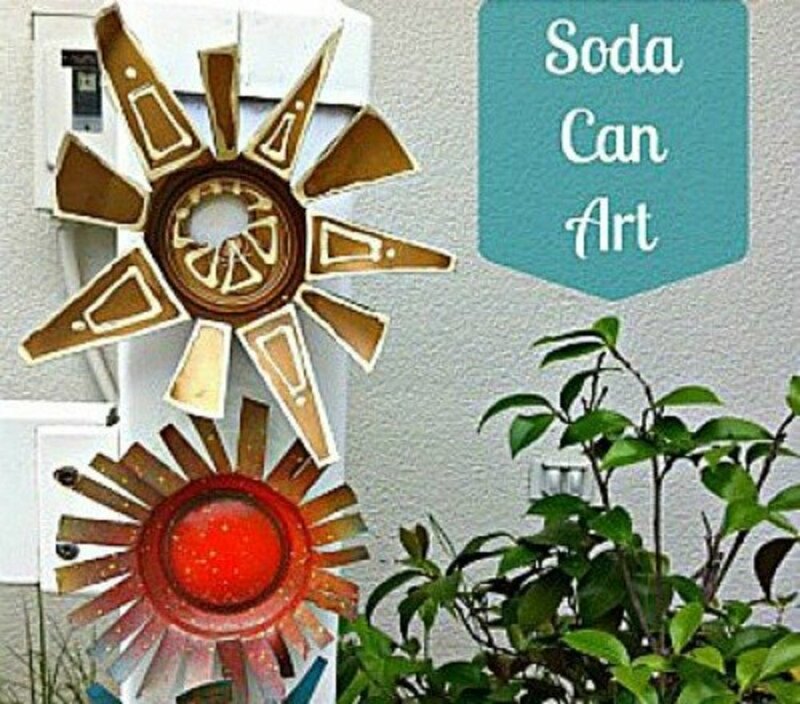 There are a lot of ways to transform an old box into something beautiful to display in your home. I hope this tutorial gave you some ideas for a project of your own! Hi Nicole - Thanks so much for reading and commenting! Thanks Nicole! I had fun making over this eyesore. Thanks for stopping by and commenting. I appreciate it! What a super cute idea! Love the creativity and finesse. Very shabby chic! Thanks, Rachel! This project was fun to do. So glad you like it. Thanks so much for stopping by and commenting! 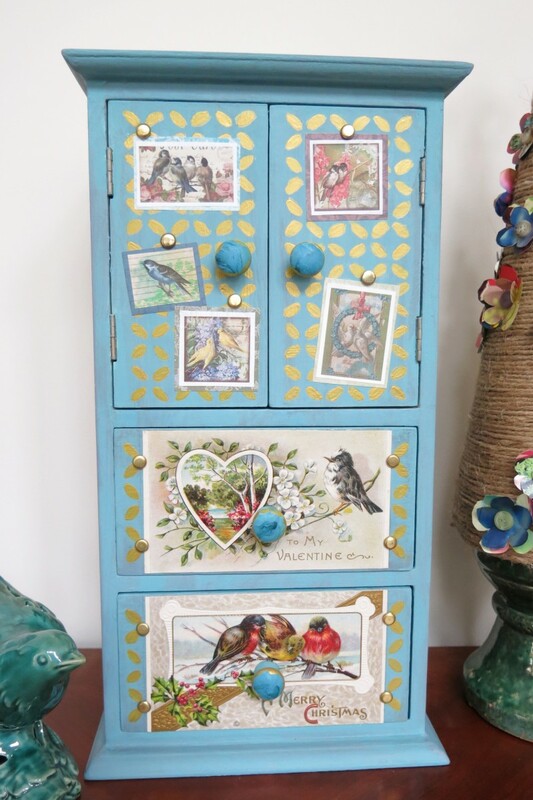 Hi Donna, How lovely you turned this older jewelry box into something special. You have a real knack. 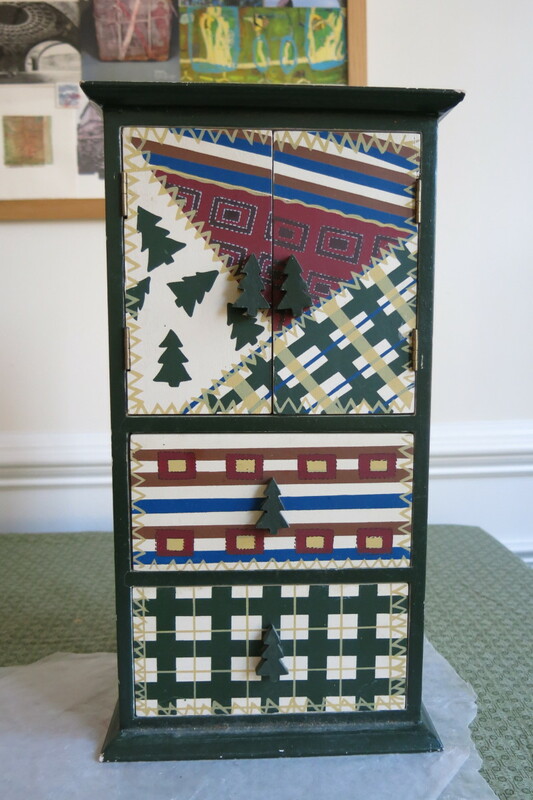 Hi Heidi - Yes, this box was particularly odd and unattractive. Who knows what it was meant to be? But I enjoyed the challenge of transforming it. So glad you like the finished piece. Thanks so much for your comments. Happy Valentine's Day! Ha! I don't think I have the patience to tackle a bigger piece. 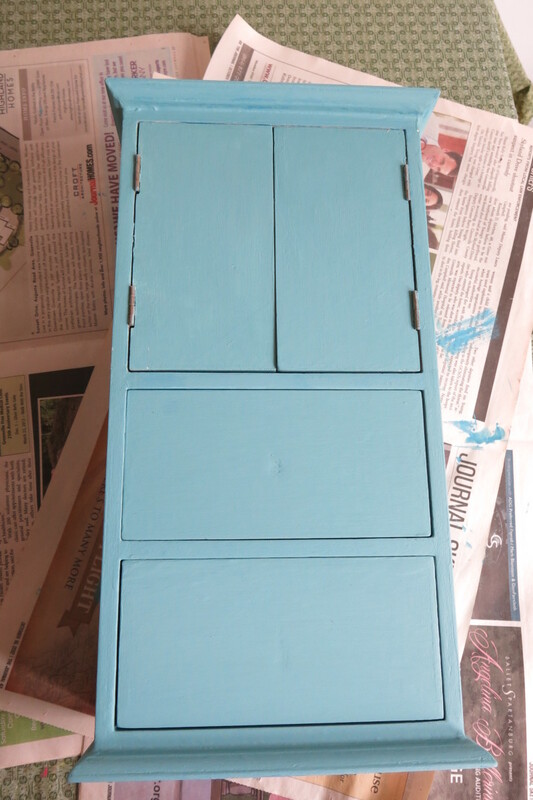 I have a bare wood bureau that I've planned to paint and decorate for years. But I haven't found the energy to work on it yet. 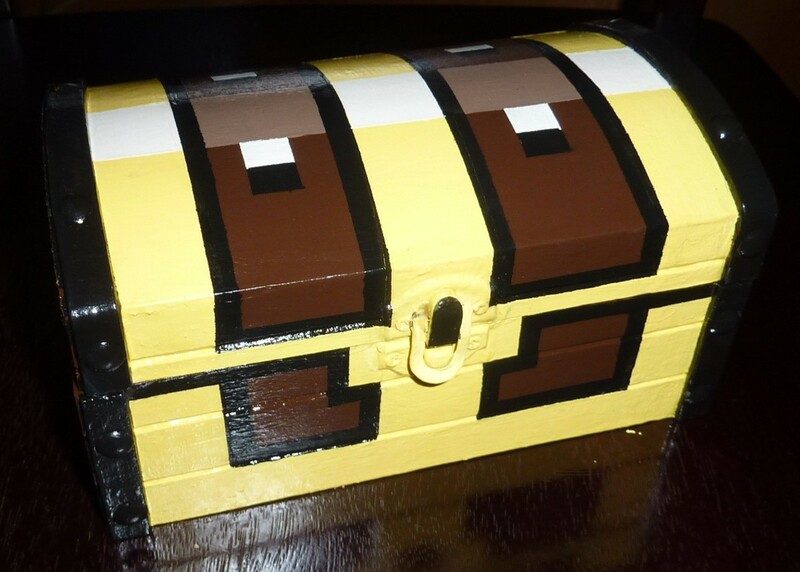 Maybe the chest will inspire me! Thanks so much for stopping by and commenting. I appreciate it! Hi Sally - Thanks so much! Replacing the knobs turned out to be the most difficult part of this project. The rest just took time and patience. So glad you like it! Thanks so much for your comments! Glad you saved this box from the fate of ugly! :) So cute and timely for today. Happy Valentine's Day! Wow - this is beautiful. At first I thought it was a full size piece of furniture. I'm impressed! I love this project Donna. What a great outcome. The box turned out great. Lovely clear instructions and photos, well done!